Kalilah and Dimnah, a book of practical wisdom, has been popular across Eurasia for more than a millennium. In the mid-sixth century, royal physician Borzuya produced the first version. Kalilah and Dimnah consisted mainly of Indian stories that Borzuya translated from Sanskrit into Middle Persian. In the mid-eighth century, royal advisor ibn al-Muqaffa produced an Arabic version of Kalilah and Dimnah. Ibn al-Muqaffa, with a keen sense for his own position, promoted Kalilah and Dimnah vigorously. The Sassanian royal physician Borzuya actually compiled Kalilah and Dimnah. Scholars of India were learned others without the status complications of the former Sassanian elite within the new Abbasid regime. Recognizing Indian learning would be a step toward recognizing Sassanian learning. That would be a step toward recognizing a distinctive area of ibn al-Muqaffa’s learning. Ibn al-Muqaffa’s introduction implicitly affirms that he understood the deep meanings of Kalilah and Dimnah. Ibn al-Muqaffa thus positioned himself to serve as a tutor to a patron seeking to read it well. According to the account of Borzuya’s journey to India, Borzuya produced Kalilah and Dimnah to provide immortality. Ibn al-Muqaffa apparently added some additional chapters morally appealing from an Islamic perspective. While illustrated books were well-known in Sassanian Persia, no direct evidence exists that Borzuya’s Kalilah and Dimnah was illustrated. Illustrations help to make works popular. Illustrations in Ibn al-Muqaffa’s version are consistent with his effort to make the work broadly appealing. Promoting Kalilah and Dimnah served ibn al-Muqaffa’s worldly interests. Ibn al-Muqaffa lacked a high courtly position like Borzuya held when he created the Middle-Persian version of Kalilah and Dimnah. Ibn al-Muqaffa depended much more on success as an author. While authors and publishers puffing books typically make money per copy sold, that almost surely wasn’t the case for ibn al-Muqaffa. He most likely created the work for a specific patron. Others who gained access to it could copy it without any payment to him. However, personal status was key to scholars’ worldly success in the ancient Islamic world. Ibn al-Muqaffa’s verion of Kalilah and Dimnah associated him with relatively attractive Indian learning. At the same time, because its source was in Middle Persian, he had a comparative advantage in accessing it. Ibn al-Muqaffa could cash out success as a source of Indian wisdom through patronage and position in the Abbasid court. Relative to Borzuya’s new spiritual understanding of immortality, ibn al-Muqaffa’s worldly interests probably contributed more to generating Kalilah and Dimnah’s enduring popularity. Borzuya produced the first, Middle-Persian version of Kalilah and Dimnah under Persian king Khosrau I (Anushirvan). Anushirvan reigned from 531 to 579 GC. Ibn al-Muqaffa was born to a noble Iranian family in Fars in 720 GC. He died about 756. He probably created his version of Kalilah and Dimnah about 750. For the scant surviving biographical details about ibn al-Muqaffa, see the Encyclopedia of Islam. Abdullah ibn al-Muqaffa’s introduction, Kalilah and Dimnah, from Arabic trans. Jallad (2002) p. 29. Jallad’s translation is based on Silvestre de Sacy’s 1816 Arabic text, as printed in Egypt in 1817 (Bulaq imprint). István Kristó-Nagy and Jennifer London have explored ibn al-Muqaffa’s non-Arabic origin in relation to his political thought and position in Abbasid intellectual circles. See, e.g. Kristó-Nagy (2009) and Kristó-Nagy’s forthcoming book, La Pensée d’ Ibn al-Muqaffa; and London (2008) and London’s forthcoming book, Autocracy and the Foreigner: The Political Thought of Ibn al-Muqaffa. Ibn al-Muqaffa also had interests common to authors. Careful consideration of author’s interests is crucial to understanding otherwise inexplicable behavior, e.g. publishing scholarly work in forms difficult and expensive for almost everyone to access. Id. pp. 35, 34. Ibn al-Muqaffa seems to have been aware of different styles of reading. The difference between intensive and extensive reading now tends to be considered in relation to the proliferation of novels since the mid-18th century. Id. pp. 29, 30, 29. The frequency and position of images in illustrated versions of Kalilah and Dimnah suggests that its most popular features were “rattling good yarns, sometimes laced with risqué elements (frequently explicitly illustrated in the manuscripts), which has always had most appeal.” O’Kane (2003) p. 26. 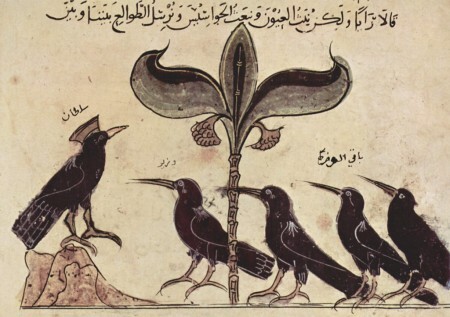 [image] The King of the Crows conferring with his political advisors, from illustrated Arabic Kalilah and Dimnah manuscript dated c. 1210. Bibliothèque Nationale, Paris, via Wikipedia. Jallad, Saleh Saʻadeh, trans. 2002. The fables of Kalilah and Dimnah. London: Melisende. Knatchbull, Wyndham, trans. 1819. Kalila and Dimna, or, The Fables of Bidpai. Oxford: W. Baxter for J. Parker. Kristó-Nagy, István T. 2009. “Reason, religion and power in ibn al-Muqaffa.” Acta Orientalia Academiae Scientiarum Hungaricae. 62 (3): 285-301. London, Jennifer. 2008. “How to do things with fables: Ibn al-Muqaffa’s frank speech in stories from Kalīla wa Dimna.” History of Political Thought. 29 (2): 189-212. O’Kane, Bernard. 2003. Early Persian painting: Kalila and Dimna manuscripts of the late fourteenth century. London: I.B. Tauris. Rice, D. S. 1959. “The Oldest Illustrated Arabic Manuscript.” Bulletin of the School of Oriental and African Studies, University of London. 22 (1/3): 207-220.